Stretch marks are painless yet unsightly scars that can appear on almost any part of the body. Some of the most common places to find them include; the buttocks, thighs, breasts, lower back, abdomen and underarms. They are formed when the middle layer of our skin gets stretched beyond its limit. These stretches impact collagen production and often leave visible lines where the skin has been unable to repair itself fully. Perhaps the most prominent and common cause of stretch marks is pregnancy. During the 9 months that women are pregnant their skin has to stretch by extreme amounts to accommodate the growing baby. Stretch marks are common-place once the birth has occurred as the skin struggles to return to its normal proportions. Luckily, there a number of natural remedies that can be employed both during pregnancy and after to minimize your risk of developing these dreaded cobweb like lines. Rapid weight gain and weight loss can also cause stretch marks for the same reasons as during pregnancy. It is also possible to acquire them during adolescence, during a growth spurt. It is also true to say that some skin-types are more prone to it than others. Coconut oil is a natural saturated fat that possesses a multitude of beneficial properties. When applied to the skin it has a deep moisturising action due in part to its humectant properties that help to keep our skin soft and supple. Coconut oil is also packed full of antioxidants that not only fight off free radicals, but also help to slow the visible signs of ageing. 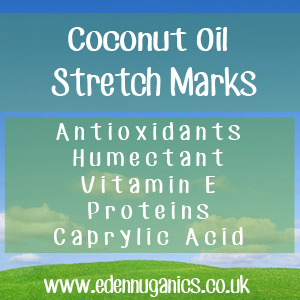 To reduce your chances of developing stretch marks during pregnancy, simply apply a small amount of extra virgin coconut oil around the thighs and stomach 3 - 4 times a day. This may seem like a lot, but a small jar of coconut oil will stretch much further than you think. For those of you looking to treat stretch marks that already exist, there a couple of additional tricks that can be employed to help reduce the visible signs. Warming coconut oil before application can aid in absorption, allowing deeper penetration of the skin; however, the use of hot oil is not recommended during pregnancy. Another great tip is to use a firm bristle brush to apply the oil to your skin. This offers an exfoliant action that helps to stimulate healing. Castor Oil - Another age old remedy for the prevention of stretch marks is the use of castor oil. It helps to reduce fine lines, wrinkles, spots, blemishes, as well as a whole host of other skin conditions. Vitamin E - Vitamin E is a powerful antioxidant that is known to help strengthen collagen fibres in your skin and protect from the damage caused by free radicals. Lemon Juice - Lemons have been recognized as excellent natural bleaching agents. The alpha hydroxy acids (AHA) and vitamin C found in lemons helps to efficiently remove the dead skin and reduce the signs of stretch marks because stretch marks usually appear as reddish lines on very pale skin. They can occur as whitish lines on darker skin so the lemon trick might not be so useful.